For fans of all things automotive, the trio of Jeremy Clarkson, Richard Hammond, and James May are three of the most recognizable voices in the world. The three hosted the relaunched UK car show Top Gear for more than a decade before a controversial falling out with the BBC, after which all three moved to the new Amazon show The Grand Tour. As a brilliant bit of promotion for the new show, they're now available as custom driving narration in the Waze navigation app. Waze has been doing this sort of promotion for a while, most recently with famous auto-tuner T-Pain and gigantic Icy Hot spokesman Shaquille O'Neal. The car enthusiast trio is arguably less famous, at least in the US, but as a pick for users who are more likely to be fans of actual driving it makes a lot of sense. To change the narration voice, tap the search button on the main map interface, then the settings icon in the upper left-hand corner. 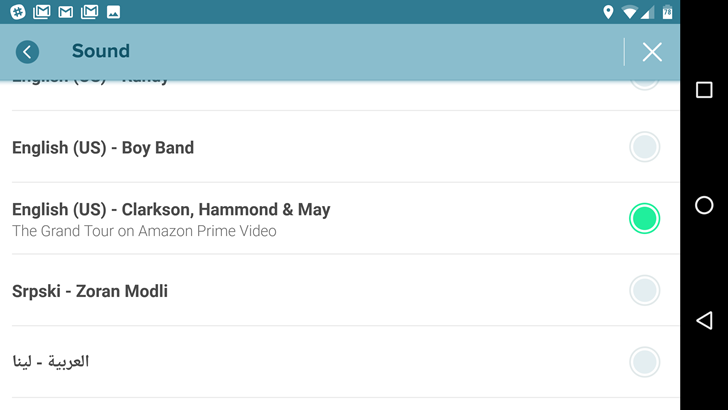 Tap "Voice language," then select "Clarkson, Hammond & May." It's only available in English, naturally. Downloading the custom prompts should take only a minute or so on a decent connection. The narration itself is a little mild - the prompts switch between the three hosts seemingly at random, and there isn't really anything to it aside from the men's very British tones. But if you're digging the new Grand Tour show and you'd like to pretend that the jaded commenters are sitting in your passenger seat, give it a try.